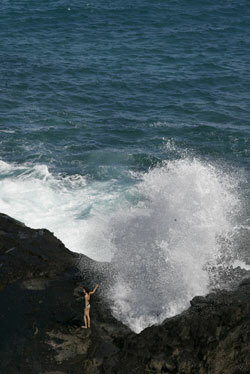 The city reopened the Halona Blowhole yesterday after extensive renovations to the popular attraction. Above, people were treated to the scenic site from a renovated viewing platform. 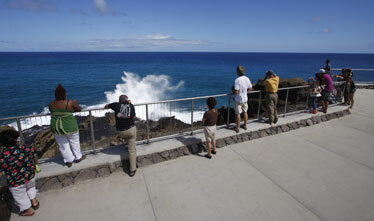 For some 13 years, landscaper Paul Antl has taken work breaks by parking his car at the Halona Blowhole lookout to feel the breeze and scan the ocean for whales. Yesterday the 41-year-old was back at the scenic site overlooking Sandy Beach, two days after the city reopened it following more than four months of repairs and safety improvements. "I've seen some crazy things, so I'm happy they did it," Antl said about people venturing over rock walls to get closer to the cliff and the Blowhole. The $1 million project replaced a lower viewing platform that collapsed in 1997, adding stainless-steel railings and a sitting area. The 42-stall parking lot, including two bus spots, was repaved, and the sidewalk, which now has access for disabled people, was etched with a compass of Oahu and a map showing the islands of Molokai, Lanai and Maui - all of which can be spotted from the rocky peak on clear days. Despite a warning sign, an unidentified woman stood directly next to the water spout. For safety, viewers should stay in the renovated lookout area. "It's probably the prettiest place I've seen so far," said Ohio visitor Bryan Alfredo, who is here on a honeymoon with wife Lisa. The renovation was completed before the whale-watching season, which typically runs from December to April as thousands of humpbacks arrive here from cold northern waters to mate or give birth. The lookout was built in the early 1950s, and railings were not installed until 1971, said project manager Gregory Hee. It was last repaved a decade ago, he said. "It is a special day," Mayor Mufi Hannemann said in a news conference. "We know this is a major tourist attraction, besides having our local residents visit this area here." City officials acknowledged more signs might be needed to discourage people from climbing or going around railings. Currently the lookout has one such warning sign. "We are going to have to look at it," said Eugene Lee, director of the city Department of Design and Construction. "Obviously, you can't keep people out. They are going to do what they are going to do. But signage is always a concern from a liability perspective." The lookout is part of the city's Koko Head Regional Park.